SAO: Alicization commences its second half with an end to the Cardinal infodump, a return to the action, and a new OP that still, unfortunately, prominently features Kirito and Eugeo’s painfully lame secret handshake, which I believe they have yet to actually use in the show itself. Ah well—no sooner do the two break into the cathedral armory to retrieve their weapons (and some new threads) than they’re attacked by the bow-wielding Crimson Integrity Knight Deusolbert Synthesis Seven. He sends a hail of arrows their way, but the lads are barely able to dodge them all without injury. Deusolbert then takes off the kid gloves, using his Perfect Weapon Control art to unveil his Conflagration Bow. 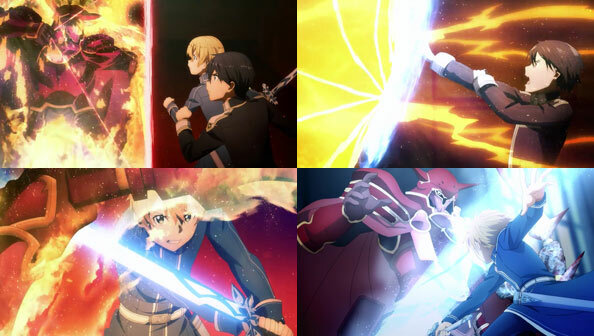 Kirito manages to slow his first shot with a series of ice shields as well as the sword skill Spinning Shield, allowing Eugeo to get close and unleash the full power of the Blue Rose Sword. In this ice-vs-fire matchup, the Blue Rose wins, and Eugeo’s Veritcal Arc delivers decisive freezing blows to the knight. It’s perhaps the most jacked up we’ve ever seen Eugeo, no doubt taking a page from Kirito, as it’s absolutely essential in this world to believe you can do what you’re setting out to do, and trust in the source of your weapon to boot. 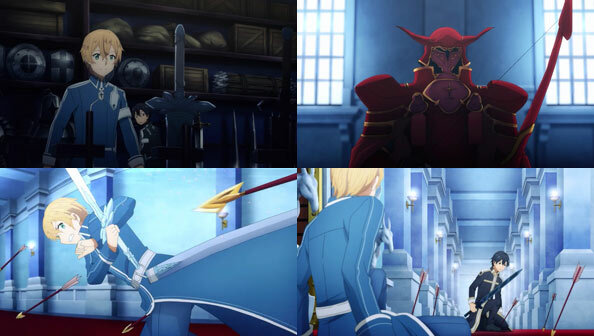 Defeated, Deusolbert asks Eugeo to finish him off, before he is stripped of his armor and knighthood and essentially frozen indefinitely by Administrator. 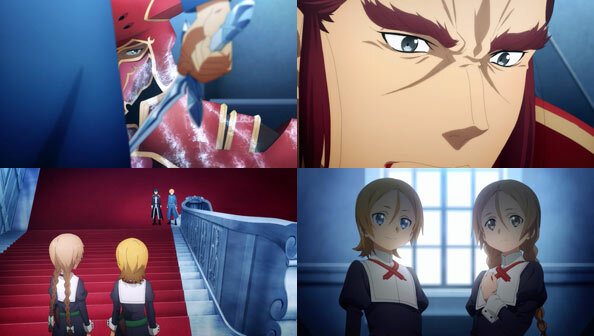 Eugeo, recognizing his name as that of the knight who arrested young Alice, bound her, and took her away from Rulid, is almost enraged enough to oblige him, but Kirito asks him to stay his sword against one who will no longer fight back. He also deduces that Deusolbert doesn’t remember capturing Alice, because Administrator erased his memories of doing so, then reassigned him to guarding the cathedral. They leave him on the staircase landing to choose whether to go back to his boss to accept punishment, heal his wounds and come after them again, or…perhaps try to remember more of the dream he always has of a young woman’s ringed hand on his arm. Integrity Knights may not have pasts, but Deusolbert definitely did. Kirito and Eugeo continue their climb to the fiftieth floor, where a host of Knights await them who have orders to take them dead or alive. But before they can get far, they encounter two mysterious girls. Are they a form of Integrity Knight we’ve yet to see, some other kind of foe…or perhaps not a foe at all? Previous Previous post: Kaguya-sama: Love is War – 01 – The First to Confess Loses!